Is your mind in the gutter? Well, it should be if you want to have a house that is in good working order. 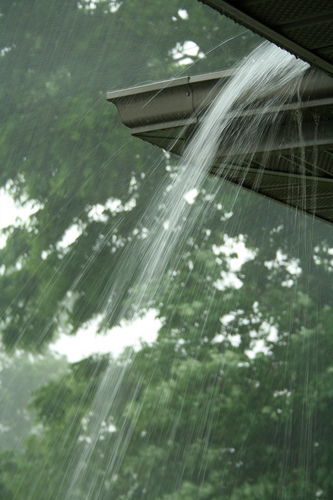 Rainwater is a natural element that can wreak havoc on a house if it’s not controlled by properly installed and maintained rain gutters. There are many misconceptions about gutters and as a result there are many mistakes homeowners are making. In some cases these mistakes are causing damage rather than preventing it. The frequency with which you should clean out gutters depends on your house. Determining factors include proximity of trees to the roof line, the type of trees (deciduous vs. evergreen), and the slope of the roof. Low sloped roofs can require more frequent cleaning. For houses with trees within ten feet of the roof line, gutters will need to be cleaned out twice a year at a minimum. In some cases gutters may need to be cleaned out a couple times in fall alone. One myth about gutters is that houses with no trees don’t need to be cleaned. Gutter cleaning may still be required, especially on houses with asphalt shingles. Over time these shingles lose their granules and these granules make their way into the gutters. Older PostDo You Have A Water Leak?